Get ready for a Wild West adventure at the Grand Canyon West Rim! Your professional driver / guide will provide live narration en route to the Grand Canyon West Rim from Las Vegas while you sit back and relax in true luxury onboard our motorcoaches. Our buses are equipped with restroom, television monitors, reclining seats, foot rests, and large vista windows for the best sight seeing experience. 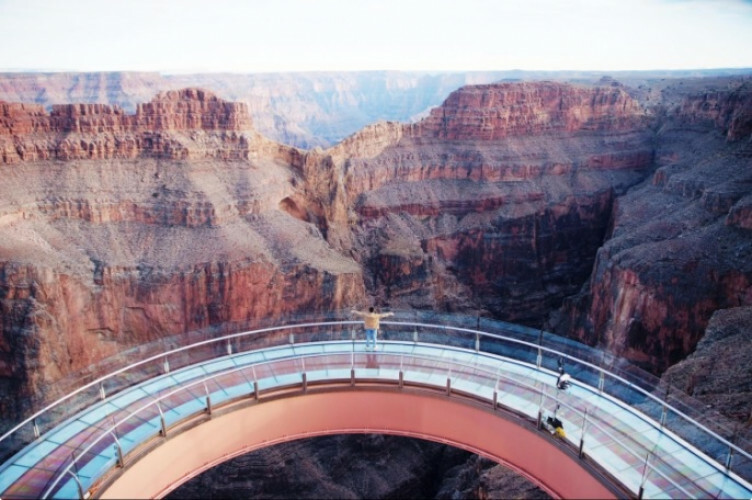 Your tour will begin with a photo opportunity of the Hoover Dam taken from the amazing O’Callaghan-Tillman Bridge, with enough time to enjoy the majesty of this engineering masterpiece and take some photos. At the Grand Canyon West Rim, visit the Hualapai Indian Country, and take advantage of the many photo opportunities with your hosts, the Hualapai Indians. Experience the ancient geological rock formations of the Grand Canyon from Guano Point. As you take in the sights and sounds of your surroundings, be prepared to be awestruck by the views from this truly unique lookout point. Meet Hualapai Indians in full tribal dress performing traditional dance (subject to availability).